After scoring 20 times over the first two games of this weekend’s series against Purdue, UT’s offense disappeared in the second half of a doubleheader on Saturday. Texas opened the doubleheader with a 13-6 pummeling. The momentum gained from that 11-hit performance, however, didn’t carry over. The Longhorns walked six times in the day’s second game, but the team’s only hit was an infield single by Masen Hibbeler. Despite the offensive struggles, the scoreboard still showed a 0-0 tie in the ninth inning. The Boilermakers then scored four times in a final frame that also featured three errors by Texas. 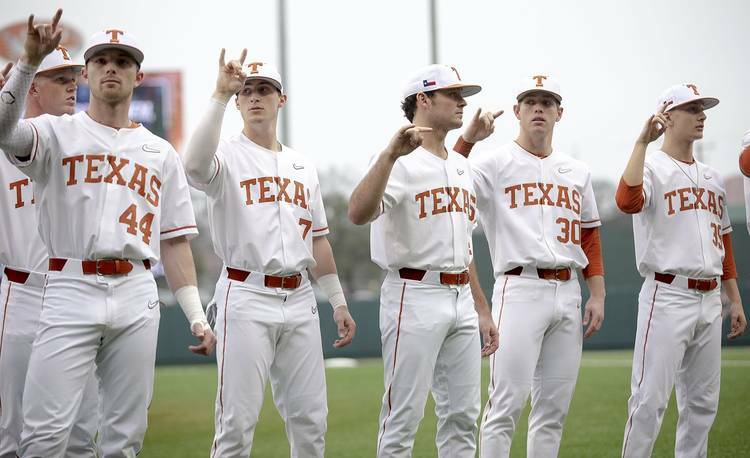 The Longhorns were retired in order during their final at-bat. Texas starter Coy Cobb did not factor in the evening’s pitching decision. Cobb gave up four hits, but no Boilermaker reached third base over the freshman right-hander’s seven innings. It was a nice bounce-back performance for Cobb, who entered the game with an 8.10 ERA after lasting only 3 1/3 innings in last week’s debut at ULL. In the second inning, Texas right fielder Austin Todd threw out Johnny Sage as he attempted to turn a single into a double. (Texas shortstop Masen Hibbeler made an excellent tag at second base on the play.) That marked Todd’s second defensive assist of the day. In the doubleheader’s first game, Todd forced out a runner who had delayed his journey to second base while waiting to see if a shallow fly ball would drop. Last year, Hibbeler led UT’s outfielders with his five defensive assists. Todd battled injuries throughout the 2018 season but still recorded three assists over 30 appearances in the outfield. NOTABLE NUMBER: 18. Among the Longhorns, freshmen Eric Kennedy and Lance Ford had the longest days at the office on Saturday. Kennedy was stationed in left field for all 18 innings. As UT’s second baseman, Ford also didn’t miss a pitch. UP NEXT: Texas (5-2) and Purdue (1-5) will close out their four-game series on Sunday afternoon. The first pitch at UFCU Disch-Falk Field is set for 12:30 p.m.
UPDATE (8:00 p.m.): Texas coach David Pierce said that he will likely start RHP Matt Whelan (0-0; 9.00 ERA) against Rice on Sunday. Pierce added that RHP Ty Madden (0-0; 0.00 ERA) remains an option. A freshman, Madden made his first-ever start at Rice this past Tuesday and he pitched for 2 2/3 innings.